With varied sports activities and a friendly atmosphere, Camping Les Demoiselles is a fantastic camping holiday site close to the Atlantic. The luxury camping site offers a mix of adventure and comfort with modern facilities and great water- and land-based recreational opportunities close to your tent or mobile home. Located just outside Saint-Gilles-Croix-de-Vie, Saint-Hilaire-de-Riez is a resort town in the Pays de la Loire region of western France. Both towns sit along the Côte de Lumière, a coastline renowned for long beaches alongside stunning coves and caves to explore. Excellent services and amenities ensure a luxury camping experience at Camping Les Demoiselles. Enjoy the comfort of this welcoming campsite and book with LuxCamp today. Why choose Camping Les Demoiselles? This fabulous holiday camping site is situated in Saint-Hilaire-de-Riez within the Vendée department, an exceptional destination with approximately 240 kilometres of picturesque sandy beaches. Camping Les Demoiselles is at the doorstep of spectacular attractions and activities, including scenic cycling and hiking paths. A water park and zoo are also nearby. Sheltered in a wooded area, this luxury camping site is only 200 metres from a striking beach overlooking the Atlantic. Relax on the beach or enjoy water sports steps from this wonderful camping holiday destination. 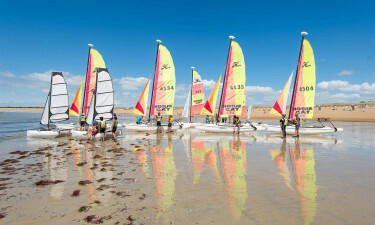 Surfing, diving, sailing, and much more are possible close to Camping Les Demoiselles. 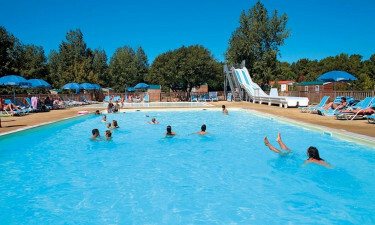 The well-equipped campsite boasts a superb heated outdoor pool. The pool area includes fun water slides and a wading pool for little campers. Children and teenagers will appreciate tailored activities and entertainment throughout their stay. There is also a ping pong table, a children’s playground, and a sports pitch.